Cat Strollers: Embarrassing or a good idea? So, what do you think? I’ll tell you what I think for what it is worth. I’m crazy about cat strollers….. 😉 Well, not quite, but…they do fix some cat problems if you can get over the embarrassment. One day, I might get up the courage and try one out in London. What is probably certain is that you are sure to meet people! LOL. Imagine going to the local shops pushing your cat in front of you in a cat stroller. At first, other pedestrians would think you were pushing a rather odd looking pram. They’d look for the baby and see a cat 😉 Then they’d look at you and probably smile and begin a conversation. Your cat gets to see, hear and smell new and stimulating things (we hope!). Your cat is safe while exploring new places. The device overcomes the need to provide fresh stimulation for your cat in safety. That can be quite hard to achieve. Is the cat stroller slightly anthropomorphic? It looks like it! It treats the domestic cat as a baby. But I think that is just coincidental. The device was not born out of a desire to treat a cat as a baby. It was created as a practical solution to the age old problem; to mentally stimulate a cat in safety. It also allows a cat owner to be with their cat more rather than being at home alone. 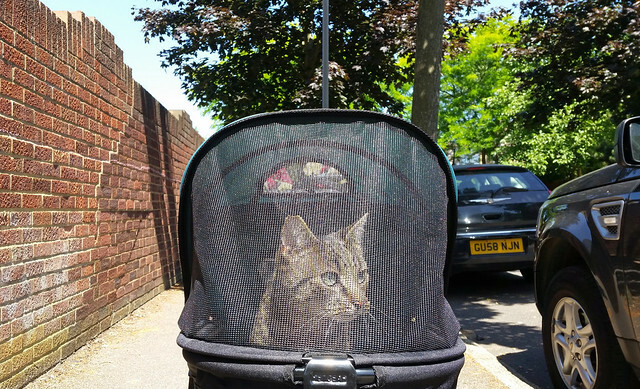 Some cat strollers look like prams which is why 90% of people you pass in the street don’t see a cat but expect to see and therefore see a baby instead. Update: I did it and went and bought a cat stroller. Here it is (below) by the Thames river near Teddigton, England. The woman is my SO. 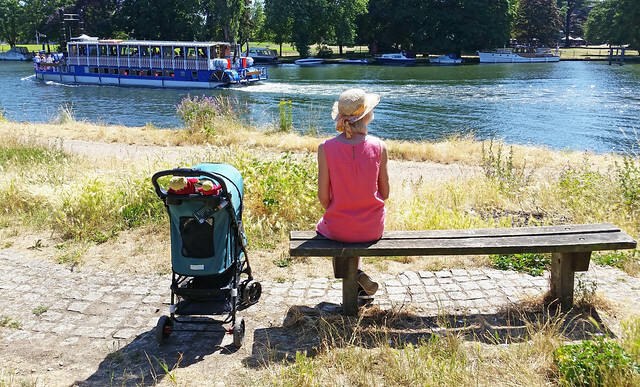 The boat is a pleasure cruiser going from Richmond to Kingston Upon Thames. It was a very fine day for a walk by the river. This was Gabby’s (my cat) first outing in the stroller. Home→Cat Products→cat strollers→Cat Strollers: Embarrassing or a good idea? This entry was posted in cat strollers and tagged cat strollers, human to cat relationship, pet strollers by Michael Broad. Bookmark the permalink. I can relate to wanting to find a way to safely let the cat have some new experiences. That’s how I first got the idea of going for a walk with a cat using a leash and harness. I had adopted a cat who felt a need to have a bigger territory to patrol , and he would have no doubt liked to go out and wander on his own, but it was way too dangerous in a busy urban area, with lots of traffic and a cat-killing Rottweiler next door who did not always stay in her own yard. and my cat Louis chased other cats and could get himself into problems that way. So I tried getting him used to a harness then a leash , and he very much enjoyed going out to patrol and rub his scent on things. It was important to him to do his regular rounds. Yes we got some odd looks from people not accustomed to seeing a cat walking on leash. but I’m sure Louis did not care. We also got people stop to say hi and admire what a big handsome cat he was, and he seemed to like the homage, which he accepted as his due. Charlie can’t say in human language “I love being a celebrity” but he can show how he feels in his own way about the experience of riding in a thing like that, or about visiting new places. and Michael doesn’t strike me as being a clueless or uncaring person who would be oblivious to (or ignore) signals. He knows his cat and he seems sensitive enough to animals that I would think he’d be likely to pick up on it if Charlie doesn’t like it — and would not keep doing it. I’m sorry if I expressed too strongly my feeling that some of the other commenters were stereotyping cats. I’m sure you don’t see cats as absolute clones. Clearly anyone who has dealt with cats a long time would know they have a range of personalities. But it still seems like some of you are not taking into account part of that range, and thus see cats in some kinds of activities as being forced to do something they could not possibly enjoy , but can only stoically tolerate. I absolutely think there is a wide variety in cats’ temperament and what they enjoy. Some are much more extroverted than others. I’vv met cats who are so social that I just cannot agree with Rose that all cats are by their species very independent, private individuals. There ARE cats like that, absolutely, but I would not apply that as a species-level characteristic. It definitely may be I have happened to meet a greater proportion of more social cats. I do agree that cats in general are proud. but I think many cats just would not care what some silly human stranger thinks about them riding in a thing like this. What I think most cats really dislike is looking clumsy (like falling off the bed , or trying to jump for something and not quite making it) and being laughed at for that. a general remark is that when you introduce something that is new, it is better to get them used to it in increments. Like if you are going to bring a cat or kitten somewhere in a carrier and they’ve never experienced that before, it is best to get the carrier in advance and set it out in the house for them to explore. I would think the same principle would apply with this thing…. you’d want the cat to first get used to the object, get their scent on it, put a blanket with their scent on it inside it. Toss some treats in, or a toy, include it in a game. The next thing is for the cat to get used to being in it when it’s moving and ideally one would want to first try that within the cat’s home territory. Then, walks in a quiet neighborhood and/or at a time of day when there are few pedestrians or vehicles about. And just be observant and attuned to his reactions and ready and willing to admit it was a mistake if he doesn’t like it. Some cats definitely would not care for it. but I don’t know Charlie and it sounds like you have some reason to think he might enjoy it. Thanks for taking the time to write this informative comment. I added a link to your comment on the sociability of the modern domestic cat. I concur that the domestic cat, subject to personal preferences, can be quite sociable. I am seriously considering trying out a cat stroller for the sake of my cat. He might like it – the sensations: smells and sounds he can’t get inside. I firmly believe that most cat caretakers, including me, can do more to stimulate a cat’s mind and make life richer. The difficulty is doing that in a world that is dangerous for a cat in many places. London is dangerous because of traffic. I am very protective of him and if he hates it the device gets dumped but as you say, a slow and careful introduction may bear fruit. Go for it, Michael! Charlie may enjoy the change in scenery with the feeling of safety. I have a 16 year old male, Oscar, who loves going for rides around the RV park where we live. I can’t afford a fancy carriage for him, but a wire pet crate in the garden utility wagon serves well. A large comfy pillow inside, a white cover on the top to protect him from the sun, and he’s ready for the trip around the park. Not all my cats enjoy the wagon. The first time we used the wagon was 5 years ago to try to entice Oscar’s wife, Bitsy, to come home after she was accidentally carried out of the house hidden in a chair. Bitsy was so traumatized, she wouldn’t let me near her and she wouldn’t get into the crate, but with Oscar’s encouragement, she followed the wagon home. 3 of my 4 yearling cats enjoy rides together around the park as well, but Oscar insists on riding solo. The carriages are nice, but when I have 3 wanting to ride together, the crate/wagon accommodates them comfortably. I live on the south side of Burleson, Texas, a southern suburb of Ft. Worth (USA). The park I speak of is set up for recreational vehicles (gypsy camp). I own and live in a large travel trailer. The RV park is surrounded by woods and when not full of RVs, can be quite pleasant to walk through. I’m no longer medically fit to drive and there are no public parks within reasonable walking distance. Our winters are mild, but our summers are brutal. When the temperature goes above 80°, our walks are suspended for the season. I’ve lived in this park for 7 years and some of the other long-time residents get a kick out of seeing me pulling my “cat wagon” around the park. Being the resident catlady has been good for the feral cats, as I’ve educated the management and other residents of the benefits of hosting a feral colony. New residents are instructed to respect the cats or face eviction. I provide a feeding station for the “park cats”, foster for a local cat rescue (currently 8 kittens & 1 momcat), and have 6 of my own ranging in age from 16 years to 1 year old. I have full time employment at a convenience store/gas station next door to the park and a girlfriend takes me grocery shopping once a week. Are you ever doing it again Barbara? To rephrase that a bit the person pushing the pram would be finger pointingly mocked and the imprisoned cat pitied but in the US the cats feelings probably wouldn’t even enter in to it by most people. Of course it depends on the cat but cats by their very species are proud independant private animals and no matter what anyone says we know they hate to be laughed at. A cat in a stroller would be finger pointingly mocked here in the UK even though probably not in the US where cats feelings are not taken into consideration by everyone. No siree,as Ruth says it’s about the person who “owns” the cat.Cats don’t care about fame or glory,so for God’s sake let them be cats. And you say you would be a celebrity Michael, yes at Charlie’s expense! I know YOU are joking but see how for some people it’s not about cats, it’s about PEOPLE! Having lived with, worked with and volunteered with cats all my adult life I think I know them pretty well and the huge lacking in the understanding of them by some people, is that they don’t take into account that cats may not be happy about their lives, but what can they do? They have no choice but to accept what fate throws at them. Cat lovers know how stoic and accepting cats are, it doesn’t mean because they don’t cause a fuss, for example at being put in a show, a pram, on a leash or whatever, that they are happy about it. We do not stereotype cats, we know they have different personalities, some are more accepting than others that’s all. In effect someone saying because a cat doesn’t protest means he is happy about what their caretaker chooses for them. So someone pro declaw says their declawed cat is going on with his life, eating, purring, etc, so what is wrong with declawing, that it can’t be that bad if the cat is happy. They don’t see the cat is NOT happy, he is just accepting! No matter how awful a cat’s life may be, suicide is not an option for cats. Cats adjust to ANYTHING because they have no choice. It is OUR duty to make their lives as happy and natural and stress free as we can. Why should they be forced to do something un-natural to them just because their caretaker has the power to do that? It depends on the CAT. Same with going for walks on harness and leash. Same for travelling with their people vs staying at home and having someone come over to look after them. Same for…. showing! Or competing in cat agility! Honestly, some cat lovers sound like they think all cats are clones in personality. They think THEIR cats would just HATE (fill in the blank) so therefore ALL cats must hate it! It is odd to hear people who I know have good intentions and love cats, repeating the same stereotypes believed by many people who dislike cats, characterizing them all as anti-social and reclusive. or “Oh dear, do I look like I’m a human infant in a pram?” It would just be about the experience. Many cats probably wouldn’t be so crazy about it. but some might find it entertaining. If you try it, I would definitely get one that is half covered and that you could have an extra cover to put on across the entire top if it is raining or if he just prefers it that way. Some cats might like staying in the covered part and watching from there. Some might be such social butterflies they want to be up front and want everyone to see them. and some might be stressed out and just want to hide — of course if the cat reacts like that I know you would not keep doing it. Thanks for the encouragement! I think the basic idea – getting your cat outside in safety – is good. I also think that Charlie would learn to really like it and I’d be a celebrity down the local shopping centre ; ) Stardom beckons. I completely agree that people do stereotype cat personalities. They are all very individual. Some would love it, first time out. Some would not and some would learn to like it. The biggest problem is the human. Well, I’ve got a bit more to say about this stroller business. I seriously wonder if you should consider one that has the veil over it. I know it’s bigger, but it would keep any sudden rain off Charlie and any bugs. Maybe you could make your own film about the first excursion and submit it to Cannes. You never know…. 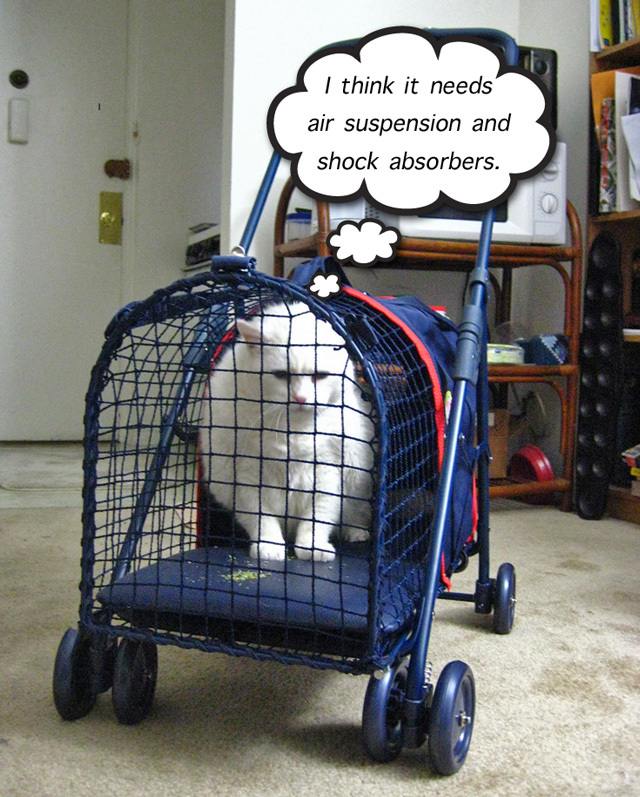 btw, here is the flickr pic from my friend mentioned above who uses cat stroller for vacation travel. I know there’s a link somewhere at POC. When I look at that picture again I go..uhh…ahhh…wow. I think the larger ones are bit better suited for a cat to lounge in. This does look a bit of a tight squeeze. I too am a bit against the hole look of a cat in a stroller. Dogs are worse. Still… I cannot ignore some very compelling reasons why we may need them in society. 1) Exercise for fat humans. Americans especially need more reasons to walk. 2) Indoor cats deserve to experience the outdoors! Just as long as you don’t acting like those weird dog people who carry their dogs in purses. Dress them up and have little parties at the park. Where they fit like 5 of them in a stroller because they are all so tiny in their little outfits and take 100000 pictures and post ALL of them to Facebook. Please spare the cat world from this! Laughing at your wry and clever comment. It’s not just dog people who dress up their dogs, alas. Some cat people do this too, which I find totally objectionable, as do the cats! This is a link from an old story at my POC supported blog (thanks again Michael)- dressing up cats. scroll to the end to see kitty dressed up as Arab. Honestly, are cat strollers worse than the compulsion people have to dress up their cats? I’m pretty sure I got the pic from this site, which has some good pix of “how to torture cats with costumes” -that’s my title, but not theirs. Honestly, why can’t people just let cats be cats, they like being cats, they don’t want to be babies in prams, they don’t want or need to wear clothes, do they! Woody, with the sawdust in his cranium? I think cat strollers are less of a problem than dressing up cats. At least they have a practical aspect to them whereas dressing up cats is just human self-indulgence at the expense of the cat’s dignity. I might get a cat stroller and get into the local newspaper 😉 It would be quite newsworthy in England as there are probably none in the country. Just had a sudden thought, I would hope Woody wouldn’t find out about you with your pram, he’d want to shoot you and poor Charlie too! Can you imagine the headlines 😉 Crazy Cat Man Buys Cat Pram! or something like that. I’m pretty sure I got the pic (arab kitty) from this site, which has some good pix of “how to torture cats with costumes” -that’s my title, but not theirs. okay, comments to shohom67 came through, when I divided them so each had only one link. original comment (not divided) with 2 links is still awaiting moderation. All your comments should be published immediately provided you use the same email and same computer each time. And you should receive this reply. LOL. I’d be sectioned as well. “sectioned”? Not a term of Brit speak I am familiar with. Can you clarify? lol- I lived in England for 10 years and I never heard that one! “sectioned” is a reference to a section of a statute (law) that allows the authorities to take a person to hospital for psychiatric treatment for their own safety and the safety of others. I don’t find the idea of cat strollers as inherently appalling as do other commenters. In preparation for adopting Tootsie I bought a cat harness and leash, thinking it would be a way to take her for walkies outdoors. I’d also seen vids of people taking their otherwise indoor cats out for exercise- maybe living in apartments, where they couldn’t build outdoor cat runs and such. By the way, where I live, there is a strictly enforced county leash law for dogs. Well, after I got Tootsie, it became immediately clear that it would be a tough go to get her to accept a cat harness and leash for walkies. But, then I saw a great pic on flickr from a friend with his cat in a stroller. Mind you, this is not a person who has a baby fetish about his magnificent cat. I think he used it on vacations in Maine, to take the cat out and about to experience new sights and sounds. So, I thought, well, maybe I could get one of those to take Tootsie out and about, to see the big wide world, as an antidote to indoor boredom. I think a lot depends on the motivations of the cat’s human, and where they take the cat. So, if the human uses good judgement, I don’t see cat strollers as terribly awful, and in certain circumstances, good for the cat. Tootsie is now allowed to go outside under supervised conditions, and she somehow knows or has learned what the safe and approved boundaries are (no scolding involved). So, I’ve given up any thoughts of getting her to wear a harness and leash, or of getting a stroller, to see the wider world around the neighborhood. I don’t want her to take it into her head that there are other interesting places she needs to explore on her own. Still, she hates being shoved into a box for visits to the vet. (Alas, that is the only way I can get her there.) If I could get her to happily accept a harness and leash, or a cat stroller, to get her into the car for the trip to the vet, the process might be less stressful for both of us. Well, VG, I am pleased you don’t hate cat strollers 😉 I accept that they are a bit strange and so on but when I take Charlie to the vet in a carrier, despite being scared witless he is curious about what is going on outside. I sense he would like to see and experience more and it would probably do him good. It would take him a bit of time to get used to it but then so would I. I think the bigger obstacle to using it is the person not the cat. Can you imagine a grown man walking along a London pavement pushing a pram with a three-legged black cat inside 😉 I’d probably get arrested. I laughed out loud at your scenario! Not to be untoward or unfeeling towards those hate the idea of cat strollers, but somehow your scenario reminds me of Monty Python. If you know what I mean. Ah poor thing,if that person is moaning about lifting a domestic cat in a basket then pity help them carrying their shopping home lol Sorry Micheal but I also think those strollers are ridiculous and unkind,as bad as show cats stuck in cages to win prizes for the glory of their owners. Being shut in confined spaces is NOT a cat’s life. Whatever next? Do the poor cats have to have their toe ends axed off incase they get sick to the back teeth of idiots admiring them in their prison and lash out through their prison bars? Put baby and cat together???????????????????????? ?Don’t give them any ideas for God’s sake Micheal,the cat would defo be declawed then to be a soft toy trapped in there with a baby to molest it. Phew…..Don’t apologise for speaking your mind. I like it. At the moment, everyone hates cat strollers. Because we are all English and love and respect cats as cats not as babies or accessories or whipping boys or attention grabbers for ourselves. Cat strollers are to me mini prison cells on wheels, the cat imprisoned for committing no crime other than being a cat in a world where cats are treated any old way the person ‘owning’ them wants to treat them. As Barbara said, they are trapped like an exhibit. They can be gawped at, poked at, laughed at, while having no means of escape to the privacy cats love. If a person can afford one of those stupid objectional things on wheels then they could afford the materials to make an outdoor run of sorts where the cat could enjoy a bit of fresh air and sunshine without an audience oooing and aahing or gawping or poking. Cats are NOT babies, they are wild at heart creatures. If I saw anyone pushing a cat in one of these things in our country I’d go right up to them and tell them to move to the USA where they would be more at home keeping cats from their natural environment instead of making a bit of an effort to provide them with it as best they can. Sorry to be blunt but I think cat “strollers” are objectionable, stupid and ridiculous. Yes cats can be, and mostly are, exhibitionists in their own homes, but that is on their own terms, in the safety of their homes, they’re not zoo animals to be exhibited, they’re not babies to be taken out in “strollers”. They are animals with legs, they have energy,they need exercise not pushing around in a basket for people to exclaim over and smile at, poor things, what if they become surrounded by a hoard of screaming kids or a dog takes a fancy to bark at the exhibit imprisoned in a basket on wheels? What’s wrong with a traditional cat carrier and a taxi or car journey to wherever you need to take the cat? Cats aren’t sociable like dogs, they don’t want or need to leave their homes and meet other people. These horrible strollers originated in America where cats are mostly denied the freedom of outdoors, please God they never become the norm in England. It’s OK being blunt on PoC. I like it. My cat loves his stroller in fact it’s good for him because it makes him happy and he always jumps in and wants to go for a walk so it depends on how your cat feels in it. I am so pleased you commented on this page. It makes me more confident about trying one. Thanks Bella. Its about making my cat happy not you,At yes I spoiled the hell out of him, what max.